Many of you already know my article "Riding on Salad-Oil". The Altmann "Combustion-Force-Turbine" (hereafter CFT resp. VKT -> Verbrennungs-Kraft-Turbine) is a machine which generates mechanical power from a variety of available fuels, such as diesel, biodiesel, kerosene, pure vegetable oil, waste vegetable oil, etc. Gasoline driven CFT's are also possible. The Altmann VKT per-se is the world's highest overall efficiency combustion engine and will replace what's in your car, boat, bike and house. 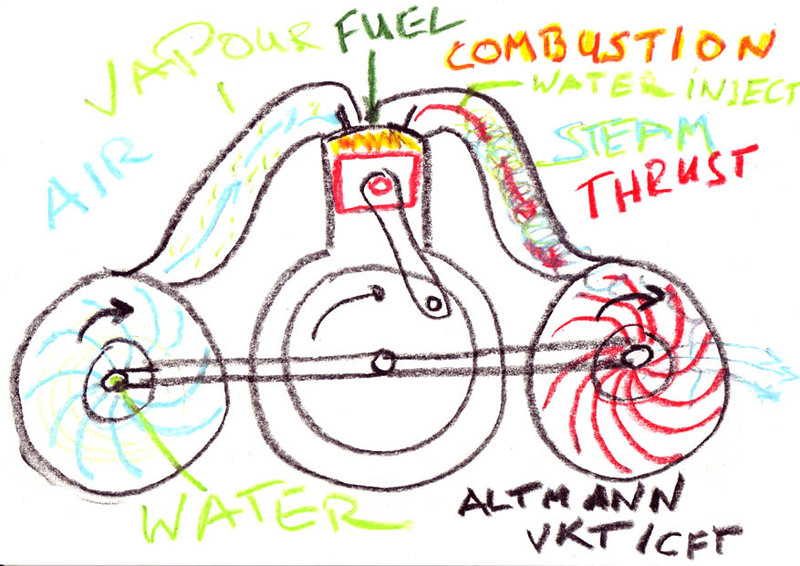 In fact, the efficiency of the Altmann Combustion-Force-Turbine is entirely adjustable. You can choose if you want to use your fuel only for heat, or only for mechanical power, or any ratio in between. The efficiency ratio of the Altmann CFT can be adjusted during runtime within seconds. This makes it first choice not only for cars but also for home power stations, because heating and electricity needs can be fulfilled individually in any desired ratio. While available combustion engines and gas turbines generate a huge amount of waste heat, the Altmann VKT has integral facilities that enable it to convert almost all of the normally wasted heat into mechanical work, if this is desired. The Altmann Combustion-Force-Turbine is also the worlds lowest emissions engine - per se. The Altmann VKT is of very simple construction and can be easily manufactured even by small companies or dedicated hobbyists. 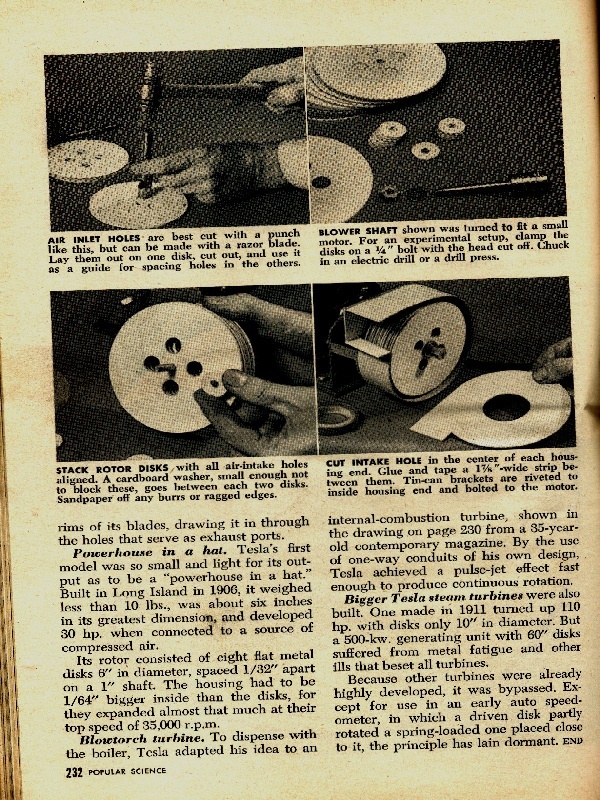 This invention draws heavily on the work of former inventors (some of their patents are quoted in the following text), and combines existing technology into a new powerful solution. On the Altmann Combustion-Force-Turbine itself and its new inventive and unique features, I have not applied any patents, consider it free. For understanding the Altmann Combustion-Force-Turbine, you need to have basic knowledge about the following principles, listed below with their Wikipedia links. For best understanding, I think it is best to expand the concepts of the Altmann Verbrennungs-Kraft-Turbine in a stepwise fashion. The basic gas turbine consists of 3 things: the compressor (blue), the combustion (yellow) chamber and the turbine (red). The compressor and turbine wheel are on the same shaft. Compressed air enters the combustion chamber through holes, is mixed with fuel and ignited (spark plug not shown). 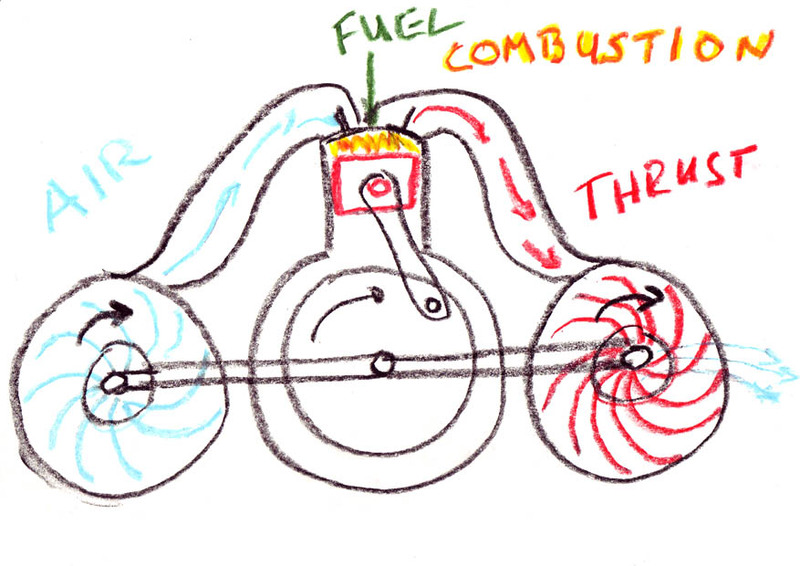 Exhaust drives the turbine, which in turn drives the compressor and results in an uninterrupted combustion. ... 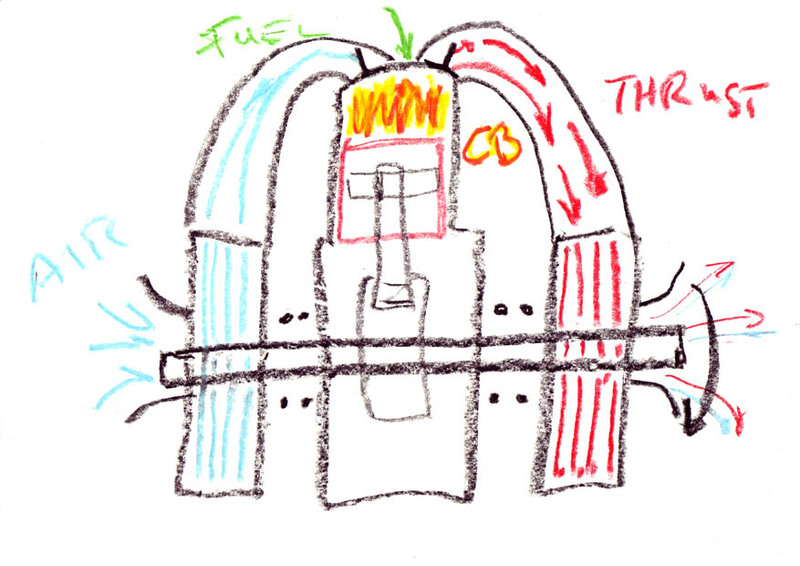 The gas turbine generates thrust and heat. Also mechanical power is generated by the turbine to drive the compressor. If we remove the combustion chamber out of the gas turbine and replace it with a diesel engine, we have a combustion-chamber (the diesel) that is able to generate mechanical power itself. The combustion is now of the interrupted explosive type. 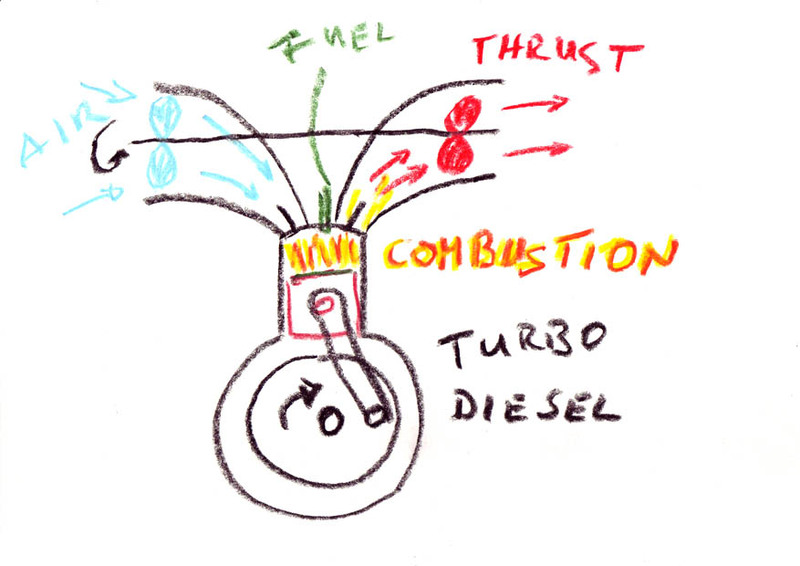 The exhaust gas of the diesel engine gives thrust for the turbine (red), which in turn moves the compessor (blue). The diesel drive shaft (crank) and the compressor-turbine drive shaft are unconnected and rotate independently (the turbine rotates much faster than the diesel). Still a lot of thrust and heat are lost into the atmosphere. And yes, this is exactly the principle of a turbo-charged diesel engine. Let's switch from axial to radial compressor and turbine and connect the compressor shaft and turbine shaft to the crank-pin of the diesel-engine. This is now a supercharged diesel engine, not a turbo, but with an exhaust turbine that gives power back to the engine. As the compressor and turbine wheels now rotate with the crank-speed of the diesel-engine (which is significantly lower than that of a normal turbo), we need bigger diameter compressor and exhaust turbine, in order to match the gas speeds. Due to the larger weight and inertia of larger diameter rotors of the radial compressor and turbine, and due to the direct coupling on the crank-shaft, the flywheel of the diesel engine can be eliminated, so that the entire assembly will have similar weight and size like a conventional diesel engine. 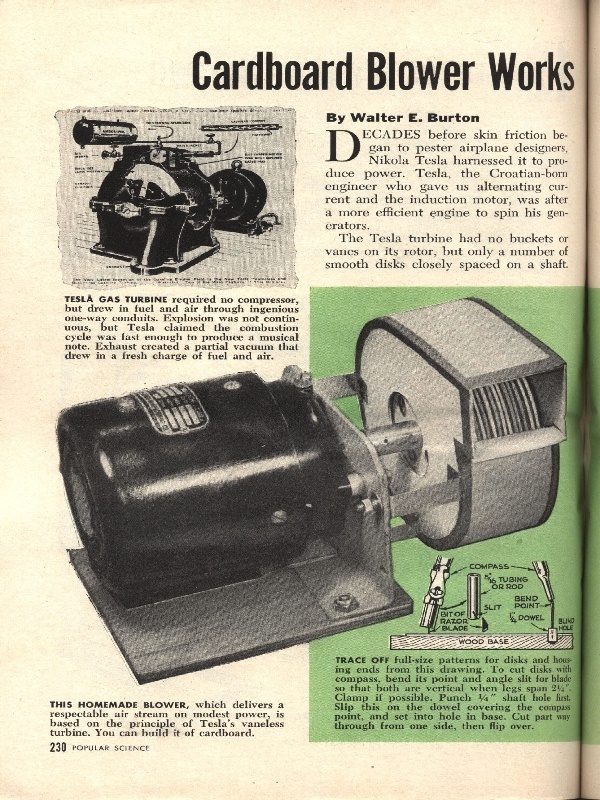 The principle of having an exhaust turbine which makes use of the kinetc energy of the exhaust gas to accelerate the engine itself is sometimes called "Power Recovery Turbine", sometimes "Turbo Compound Engine" (although it is not a turbo) ... and has been used in some aircraft engines in the 1940's. It is also used in some truck diesel engines today. A) It is a gas turbine driven by pulsed combustion (explosion as opposed to continuous combustion in a conventional gas turbine) plus the feature that the combustor (diesel engine) is not only generating gas thrust, but is also doing work (adding torque to the shaft of the compressor and turbine). or B) It is a supercharged diesel-engine with a direct-coupled exhaust turbine, where the kinetic energy of the exhaust gas (which is normally wasted) adds torque to the engine. Both A) and B) are correct. A problem with limited efficiency in the piston engine lies in its limited piston stroke. The longer the stroke, the more can the expanding gasses be used for work. With a short stroke hot gasses leave the engine unused. However longer stroke also means higher piston speeds, and as there is a mechanical limit for piston speed, long stroke engines have to run at lower rpm (limiting output power). Btw. the highest efficiency diesel engines (around 50%) have a piston-stroke of over 3 meter ! Now it gets interesting. Reading through the material concerning Nikola Tesla's turbine, one gets the imression that he really was on to something, but somehow it did not seem to work out. 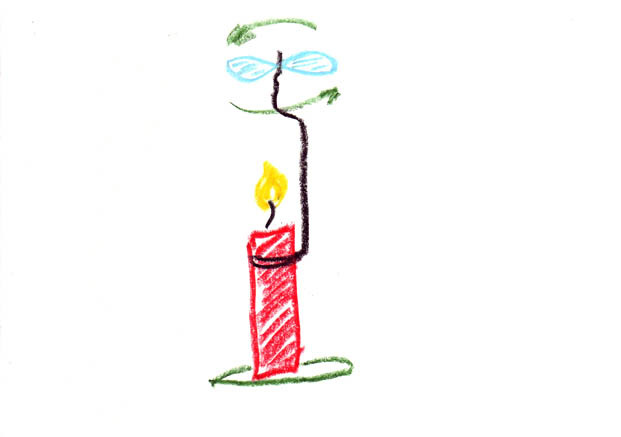 On some pictures and drawings you see that he was trying to power his bladeless turbine with a combustion chamber, comparable to that of a gas turbine and not using any compressor at all. The air and fuel was supposed to enter the combustion chamber through Tesla's fluidik valves, causing turbulence (if working at all) reportedly leading to a pulsed combustion. However, even if his combustion chamber did not work well, his turbine has some very interesting properties. Apart from its simplicity the gas flow can move in 'its own' spiral from its tangential intake to the turbines exhaust located in the center. And the longer the way the gas moves inside the turbine the better it can add torque to it. Another cool aspect is that you can easily adapt the Tesla turbine to your application, as more discs mean more power (capability of more gas flow) and larger diameter means more efficiency (longer spiral) and more torque. Tesla Turbines have interested many scientists over the course of time, here are 2 interesting papers: Tesla Turbo Machinery and Tesla Turbine Simulation. Now it gets even more interesting. A Tesla turbine can also work as a blower. If you turn it, it will blow air at you. 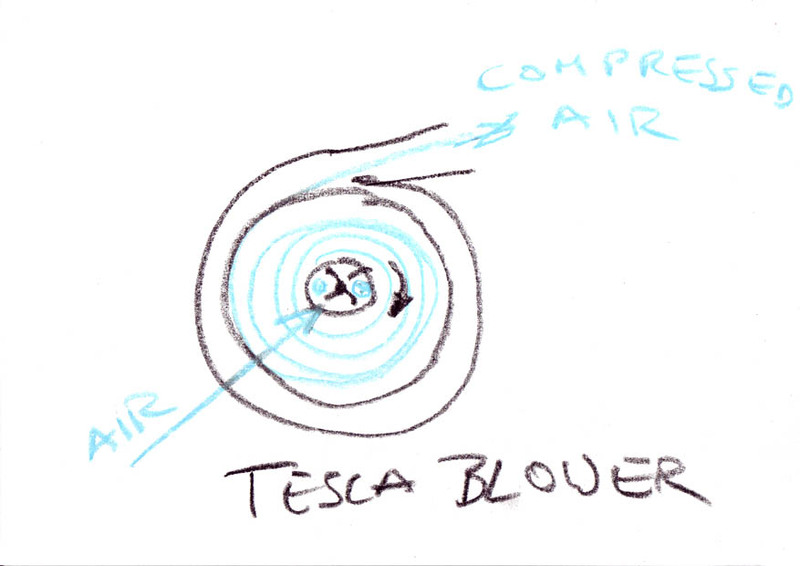 So we use the intake Tesla turbine as a compressor, lets call it a Tesla blower or Tesla compressor. I found an interesting article (1, 2, 3) from popular science magazine on the internet. This is now a side view of the radial turbines and diesel engine. You see the large shaft that all 3 are running on. 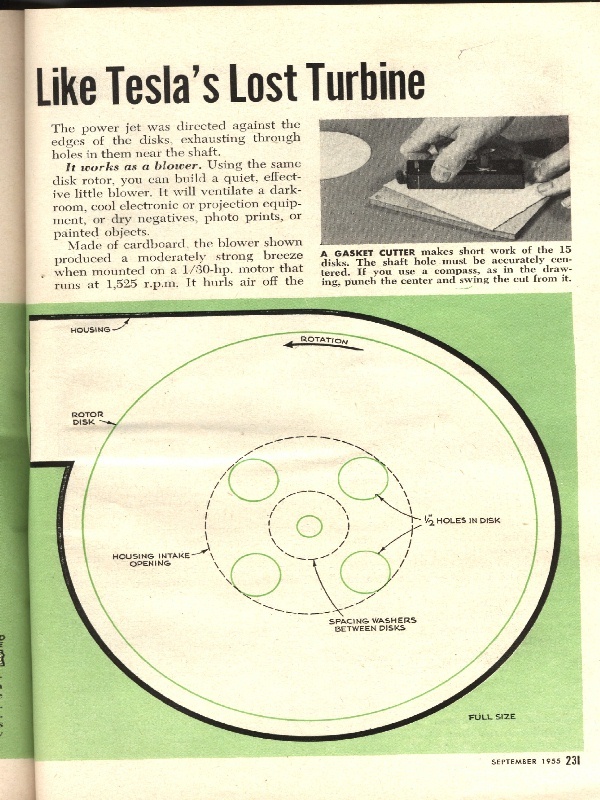 The dots right and left shall indicate that you can use a 1..2..4..6..cyliner-, or any number of cylinders engine. Btw. why do I always draw diesel engines ? Why not gasoline Otto or Wankel engines ? A diesel engine does not have a throttle valve and thus it has better efficiency when running below full throttle. Other than that the entire system of the Altmann VKT will work just as well with gasoline engines. We have a compressor, piston engine and turbine on the same shaft. Kinetic energy of exhaust gasses of the diesel engine are used to drive the exhaust turbine which in turn accelerates the diesel engine. Compressor blows into piston engine intake (increasing engine power and efficiency). At low revs, sucking action of engine in turn accelerate the compressor rotor returning force to the engine. We use a radial compressor and turbine design. The mass of the compressor- and turbine-rotors act as flywheel mass for the diesel-engine (which does not need its own flywheel anymore), so the weight and size of the Altmann VKT is similar to that of a conventional diesel engine. 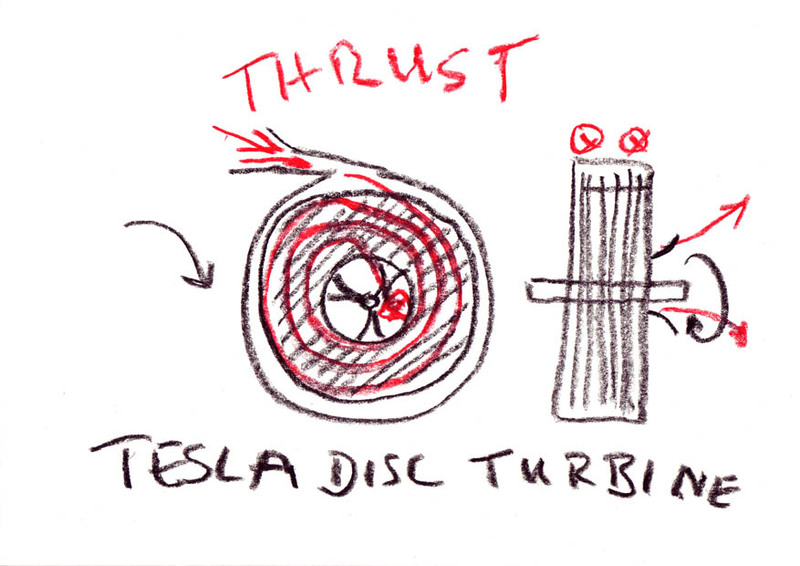 Tesla bladeless turbines can optionally be used as the compressor and exhaust turbine. Up to now we have only regarded the kinetics of the VKT, but what about the heat ? The piston engine will produce much heat and needs to be cooled and I have promised you, that we can use that heat either for external heating - OR - convert it into mechanical power in any ratio we like. A normal piston engine is air- or water-cooled (externally cooled), and most of the heat is transferred to the atmosphere. That works very well, however somehow it is also quite stupid, just like heating a house, which has not roof, in winter ... can it be more stupid ? Heat is energy and instead of heating our surroundings we can make it work for us. We have to cool our engine, we have excess heat, what about cooling the engine and converting the heat into mechanical power at the output shaft ? The Altmann Combustion-Force-Turbine can do exactly that. Instead of conventional heat exchange cooling (external cooling), the Altmann Combustion-Force-Turbine also employs evaporative internal cooling, which in turn creates steam-pressure to drive the diesel engine and even more steam-pressure to drive the exhaust turbine, thus making the Altmann CFT a combined gas- and steam-engine as well as a combined gas- and steam-turbine. There are 2 types of evaporative cooling. 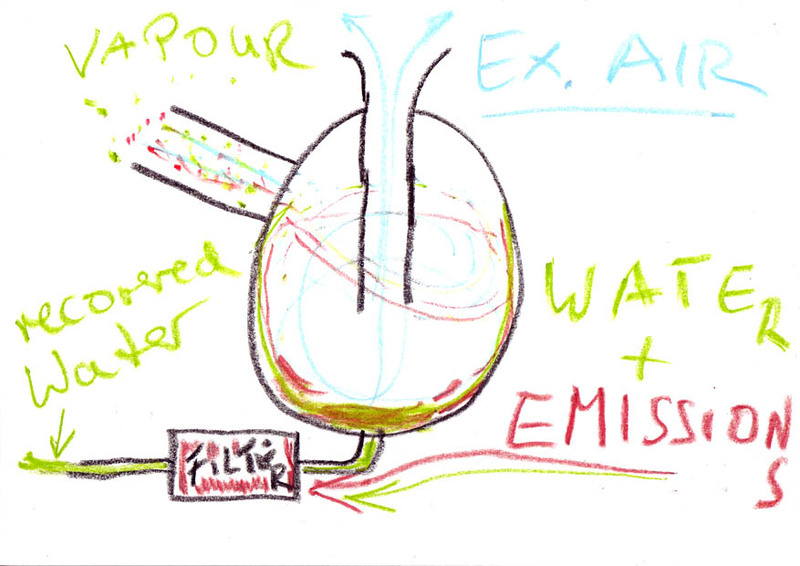 The first is low temp evaporation, the second is boiling-evaporation or flash-evaporation. I will give you an example of both. 1) You come out of the swimming-pool, and there is a fresh breeze of air ... brrrr ... you're catching a cold. That's low temp evaporation. 2) You drop one drop of water on a hot cooking plate. The water drop will bounce and sizzle generating lots of steam. That's a flash evaporation and it does in fact cool the stove plate. Both kinds of evaporative cooling are employed in the Altmann Combustion-Force-Turbine. There are 2 separate cooling systems on the Altmann VKT that cool the engine and both convert heat into mechanical power. The first cooling system of the Altmann VKT is at the intake side, the second cooling system is at the exhaust side. There is one application of the tesla turbine which you never have seen and even Tesla did not write anything about it. It is almost completely accicentally. This application is air-humidification and there even is a product available for room humidification which uses rotating discs, just like those inside the Tesla turbine. It is called the Venta-Luftwaescher (air purifier). On this air humidifier the discs are partially immersed in water and rotate slowly. The water sticks to the discs and they form a large surface area for evaporation. On the Altmann Combustion-Force-Turbine water is applied to the center of the rotating discs of the Tesla-Compressor (i.e. through the drive shaft). Due to the centrifugal forces caused by the rotating discs, water will spread on the entire surface of the Tesla discs (which is a quite large surface). As all the intake air is also blown through the same discs there will be a very powerful cooling effect on the intake air, without causing any flow restriction. Unlike a conventional intercooler (which does restrict air flow) the compressor of the Altmann VKT uses the above explained evaporative cooling which is much more efficient in cooling and does not restrict air flow. An adjustable amount of finely atomized water will enter the diesel intake together with the super-cooled air. Improved efficiency because of cooler intake air. Improved power and efficiency because of denser (more) air. Internal cooling of the diesel engine (instead of entirely external cooling on a conventional piston engine). 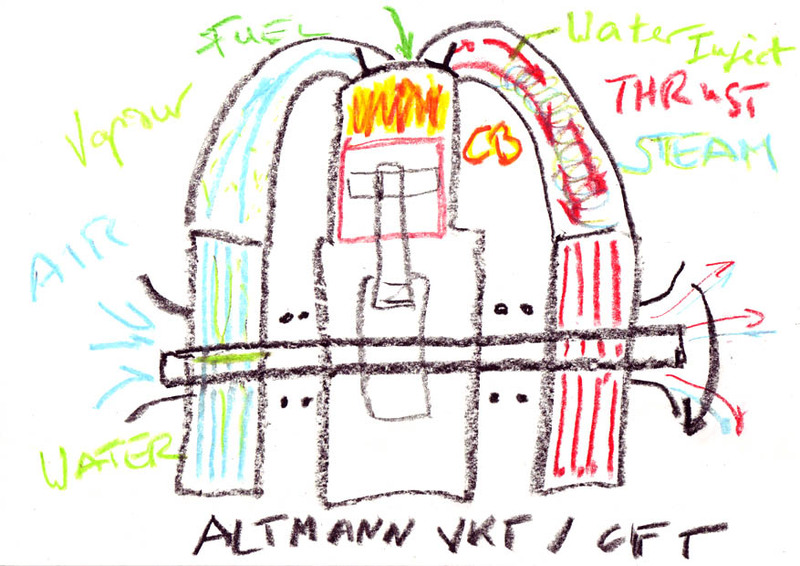 In fact the Altmann VKT should be thermally isolated as we want to keep all the engine's heat to either do mechanical work or heat only the stuff that we want to heat (our house, or car's passenger cabin, etc). Improved power and efficiency because of humidity in intake air, which converts to steam pressure during combustion, acting as a boost for piston force plus boost of combined gas and steam flow in the Altmann VKT's exhaust turbine. You may have seen a race engine running on a dynometer. The exhaust pipes are red glowing. Looks impressive, but is just a stupid waste of energy. This is the area where most of the fuel's energy appears as heat and normally it is considered waste energy. Water is injected (high-pressure sprayed) in the area close to the exhaust valve. The heat will cause intantaneous flash-evaporation of the injected water and huge amounts of steam will be created which in turn act as cooling and drive force inside the exhaust turbine. This way the entire heat of the engine, which is primarily generated by burning the fuel (diesel, kerosene, biodiesel, salad oil, ethanol, etc.) will be converted to mechanical power. The final exhaust gasses behind the exhaust turbine will be almost as cold as the surrounding air. One normally thinks that the exhaust valve of the piston engine is a flow restrictor and limits the power of the gas-flow, that would be available for the exhaust turbine. However this power is not lost. It will become apparent as heat in the area of the exhaust valve and this heat is changed to thrust by the flash-evaporation / steam-generation that happens inside the pipe. This is very similar to what happens inside a heat-pipe. Water will condense at cold areas and then creeps to hot areas automatically just to turn into steam again, leading to powerful cooling at the same time. The difference is, that the Altmann VKT uses this steam for doing mechanical work, as the only way out, is the exhaust turbine. So the heatpipe process will go on and on, because new water is pressure-spray-injected close to the exhaust valve. I promised above that we can control the efficiency, the ratio of heat vs. mechanical power that the Altmann VKT should provide to us. The Altmann CFT's internal cooling systems at intake and exhaust are temperature regulated. As the engine is started it needs to warm up first before we can make use of any cooling. Also we do not want to ice or water-flood the engine. There is one temperature sensor mounted at the combustion chamber. This controls the intake water supply for the intercooler/blower/atomizer. Below a certain temperature water supply to the compressor is stopped. The same principle governs the exhaust water injection. A temperature sensor near the exhaust valve controls the water injection, and again, below a minimum temperatre, water injection stops automatically. Now if you want to reduce efficiency (generate heat instead of mechanical power), all you have to do is to externally cool the engine, just like the normal water cooling that you have in your car. If you externally cool the combustion chamber and exhaust area by water circulating through a pump, you can use that hot water for heating purposes in your house, car, etc. As this external cooling will reduce the temperatures below the activation point of the internal cooling triggers, no internal cooling will occur. If you stop the water pump of your external water cooling system, the engine will heat up again, and internal cooling /steam generation will start automatically and the engine Altmann VKT will transform heat into mechanical power. This way you can have any ratio of heat / mechanical power that you like to have, without wasting any of your fuel's inherent energy. You may have already guessed by now that for the internal cooling / steam generation of the Altmann CFT a water tank is required and has to be filled-up from time to time, just like the fuel-tank. However to minimize the water tank-size, and also to have a dry final exhaust gas (CO2), most of the water is recovered in a special kind of exhaust system, initially invented by Schauberger Jr. This exhaust is egg-shaped and exhaust gasses enter tangentially from the periphery. This creates a spiralling movement of exhaust gasses and the centrifugal forces cause the gasses to come into contact with the egg-housing for a couple of revolutions. This way most of the water vapour will condense on the inner wall of the egg. 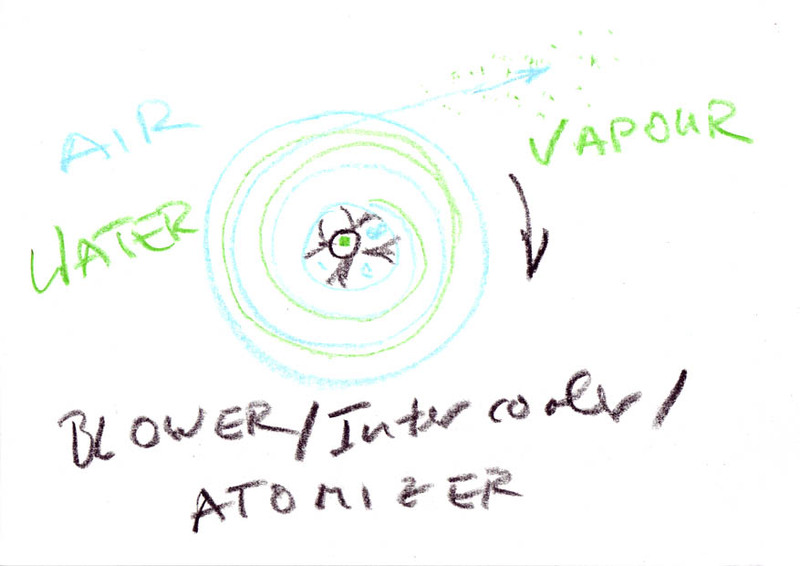 As the water vaper holds most of the still remaining emission particles (i.e. fine dust), both emissions and water will be trapped inside the egg, and only dry cool exhaust gas (CO2) exits the egg-shape exhaust at the top. At the bottom of the egg, water and trapped emissions flow through a pipe to a filter, in which all the fine dust is filtered and pure water is recovered for further internal cooling/ steam-generation.